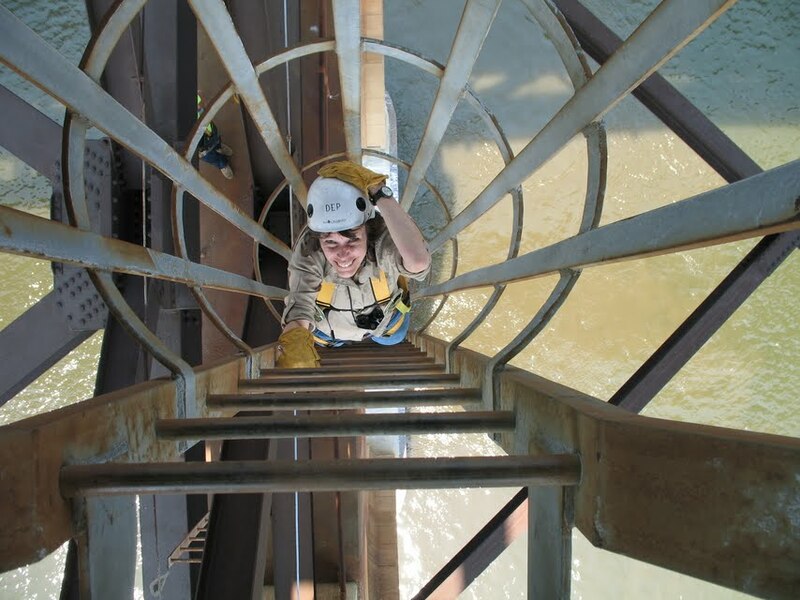 Barbara Loucks scaling a bridge in upstate New York, to band baby peregrines. Reaching into the trunk of her car, Barbara Loucks pulls out a sleek tripod and a leather case, with a silver bird embossed onto its polished surface. Opening it up, she gently lifts out the precious contents and lays them out on the grass. She deftly fits the parts together, turning knobs and adjusting magnification until she is satisfied with her work. The Swarovski spotting scope is set up and focused on its target: a peregrine falcon nest high above the rippling Hudson River in downtown Albany. From the Rensselaer Riverfront Park, we watch the nest, which is snuggled in a cement beam under a bridge. While we wait to see a bird, Loucks is feeding me little tidbits of information. “Their vision is eight times better than ours,” she says. “Imagine having that superpower!” Through the powerful scope, I see the mother peregrine bob up from her roost, her bright eyes and yellow beak in sharp focus. “Look at that!” Loucks exclaims. “They have such beautiful heads, don’t they?” The Albany peregrine has laid five eggs this year. Any day now, maybe as we watch, the baby birds will hatch. A veteran wildlife biologist at the New York State Department of Environmental Conservation, Loucks and her work have long been intimately entwined with the birth — and rebirth — of peregrines in the state. In the early 1960s, the peregrines in New York state went from about 45 pairs to a gaping zero in just twenty years because of DDT pesticide poisoning. But in today’s New York, there are 76 peregrine falcon nests, one of modern conservation’s biggest success stories. Loucks, in her 33 years at the DEC, has played a big part in this dramatic comeback. In April, Loucks is already busy with the field season. “The birds are back and nesting,” she says. Her busiest time of year is spring through summer, when reports of peregrine sightings start coming in from DEC biologists around the state. Two new eggs in Buffalo, a new breeding pair in Rochester, a nest in New York City — as mother falcons begin their months-long, patient vigil of incubation, news trickles steadily in to Loucks’ green-domed office in Albany. With her partner Chris Nadareski, she identifies adult falcons that have migrated back after the winter and checks on the breeding couples. She counts nests, packs nest boxes with soft pea gravel so the eggs don’t roll out and cajoles big-city bureaucrats into preserving falcon nests on their bridges and buildings. “Barb is very good at being the face of the department and explaining the importance of our work,” says Mark Kandel, a long-time colleague and falcon scientist who works for the DEC in Western New York. Things get really crazy in May, when the chicks are newly hatched. Loucks is in charge of visiting peregrine sites all around the state — from the Adirondacks to the Hudson Valley and even Manhattan, where 14 peregrine pairs are currently nesting on high-rise structures. She helps local scientists with the annual “banding” schedule, the process of identifying and tracking the birds for life. The banding is documented on archived webcam feeds, put up every year by the owners of various buildings where the birds nest. In the videos, Loucks’ hands hold down angry, squirming baby falcons, while her partner clips the metal bands onto their talons. Loucks remembers the first time she saw the magnificent birds of prey, or raptors. “I must have been in eighth or ninth grade,” she says. “It was before I could drive, so I talked my mom into driving me up to Hawk Mountain.” A beautiful 77-year-old raptor sanctuary in Pennsylvania, Hawk Mountain was the perfect spot from which to watch the annual hawk migration. “In the fall you can see large numbers of raptors migrating by,” says Loucks. That’s when she truly was hooked. Armed with a master’s degree in wildlife management from the State University of New York at Syracuse, Loucks started off as a volunteer at the DEC in 1978. “My first project was doing a statewide survey of the threatened Northern Harrier, a hawk that lives in wetland areas,” she recounts. Once she was officially hired, she was put on the Endangered Species Unit. “Back then we had a mammal person, an invertebrate person, a reptile and amphibian person.” Now, with budget cuts, the team is down to two. “And I’m the bird person,” she says. “I work mainly on birds of prey.” In the course of her career, Loucks has shinnied up a 100-foot scaffolding on the face of Riverside Church, climbed wobbly ladders on the Newburgh-Beacon Bridge (“That was kinda hairy,” she giggles) and braved the wrath of peregrine mothers on the high window ledges of Rochester’s Kodak Building. “She’ll hike, she’ll canoe, whatever it takes to get there,” says Mary Beth Warburton, an old friend of Loucks’ and a DEC falcon scientist in the Adirondacks. Her love of birds has taken her around the world, from Tanzania to Vietnam, and she keeps a meticulous journal of her adventures. “I once saw some beautiful kingfishers, blue and gold, in Kerala,” she says animatedly, referring to a region of southern India. The main focus of the DEC’s bird unit in 1978 was bringing back locally extinct birds like the osprey, the bald eagle and the peregrine falcon. Because of the effects of DDT, the birds were laying fragile, thin-shelled eggs. Thus, the peregrines began to die out until there were none left east of the Mississippi. Loucks’ job was set out for her: She had to coax the peregrines to return and breed. To accomplish this, she acquired falcon chicks from the Peregrine Fund, an organization founded by Tom Cade, a Cornell ornithologist, in 1970. The Fund bred peregrines obtained from elsewhere, in captivity, so the young birds could be set free. With her team of round-the-clock student volunteers, Loucks tirelessly “hacked” or raised hundreds of young birds by hand, in tiny wooden boxes, atop Hurricane Mountain in the Adirondacks. When they were fully fledged, Loucks’ team freed the birds into the wild, hoping they would come back to nest. Apparently, the shot in the dark worked. Two falcon pairs hacked in the state returned to nest in New York in the spring of 1983, after a twenty-year absence from the state. “The released captive bred birds formed the foundation stock for the revived eastern [falcon] population,” says Loucks. “The whole peregrine program has been such an amazing success,” says Warburton. When the hacking experiment was begun, she says, “[The DEC] needed a person to stick with the program and see it through.” With steadfastness and tenacity, that’s exactly what Loucks did, Warburton adds. New York City proper is home to 14 peregrine pairs today, more than ever before. “Cities and urban areas have a lot of prey, like pigeons, starlings, blue jays,” she says. The soaring towers and sky-high bridges echo the cliffs of the Adirondacks and Hudson River Valley, and are attractive to these hunters. One of these urban nests is nestled on the fourteenth floor of 55 Water Street in lower Manhattan. In 1997, the office building, owned by the State of Alabama, agreed to house and maintain the nesting peregrines every year. Frank Magnani, Loucks’ in-house contact at the site, has thrown himself into the world of peregrines. “The thing I most enjoy is seeing an animal that was going to be extinct coming back,” says Magnani. “And feeling like I was part of helping get that done.” With Magnani’s help, high-speed live cameras have been installed round the Water Street nest. Loucks and the other DEC biologists fervently hope that no new contaminant problems arise with time. As long as there are no more DDT-type issues, Loucks says, habitat is the number one priority for all animals — the peregrines need an undisturbed, healthy place to build their homes and bring up their young. Correction: An earlier version misidentified Tom Cade as Tom Wade, and Mary Beth Warburton as a scientist at the DEP instead of the DEC. The number of peregrine falcon nests has also been corrected to reflect current data; the number has increased to 76 from 64. Pre-DDT falcon populations have also been corrected; before use of the pesticide began, there were 350 peregrine falcons east of the Mississippi, not in New York state, where there were approximately 45.